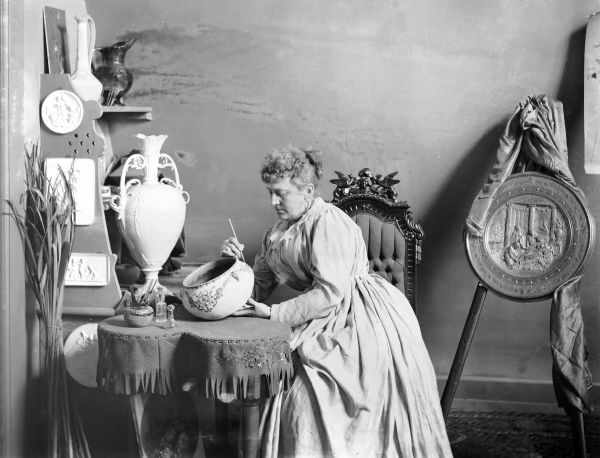 Studio portrait of Susan Frackelton, sitting at a table painting a bowl and surrounded by her art work and a large medal. Caption on back reads: "Mrs. Susan S. Frackelton of Milwaukee, WI. Artist in ceramics and inventor of the gas kiln, frequent exhibitor of decorative pottery and medal winner at leading expositions in the United States and Europe in the 1880s and 1890s. Chicago Times Herald, Sunday, Feb. 17, 1901."